Wedding planning is over. In fact, the wedding was perfect. Craig and I couldn’t be any happier right now. To be honest though, we’re both relieved to get back to normal everyday life. No more having to make decisions on this or that, no more paying deposits or meeting with vendors. Now it’s just easy sailing for the time being. This means finding happiness in mundane, daily tasks. Speaking of mundane, I never even thought I would get into gardening, let alone rose culture. It wasn’t until I moved into this house with Craig that I discovered my love for roses. There’s a small rose bush right in front of the porch. It was rather neglected when I first moved in–unpruned, untended. And although it still had healthy green leaves, it just didn’t bloom. May 13, 2016. This was taken a couple months after I officially moved in. Notice some of the bare, extra canes. That’s what it looked like when I first began taking care of it. There were a few dead canes and a lot of canes that weren’t producing anything, just taking up space. When I began researching rose pruning, I realized it really was a bit of an art. There wasn’t a set formula for it. 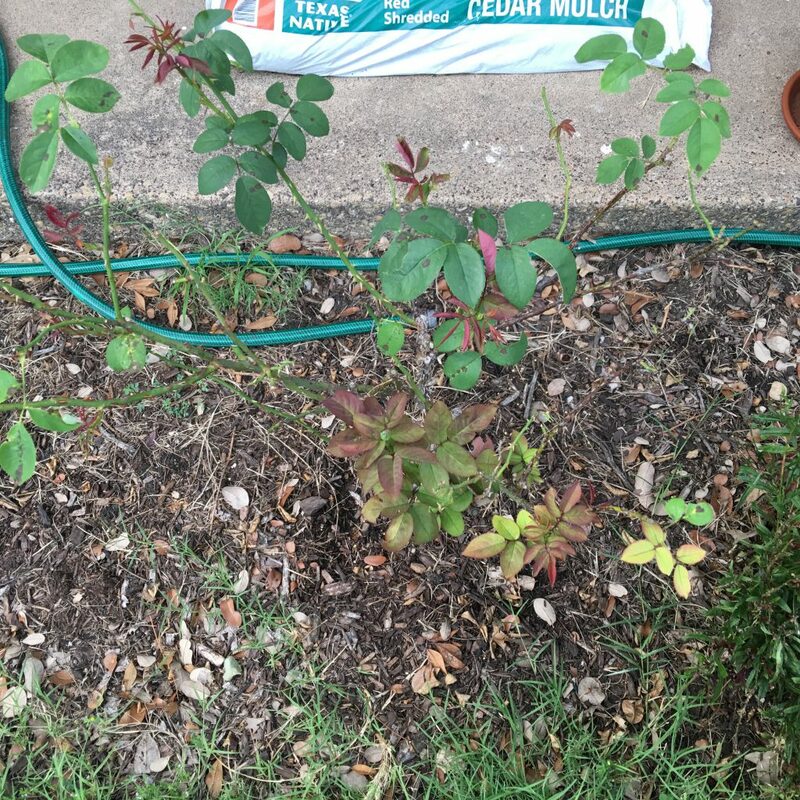 And although there are tips and best practices, you still have to take into account the actual rose bush itself. What size is it? How do you want it to grow? What do you want it to do? Your answers to those questions will determine how you prune. So I trimmed it of its excess canes. I don’t have an after photo because at the time I wasn’t really planning on turning it into a thing. A few weeks later though, I noticed some leaves began to change color, and even the new growth (the darker red leaves) were beginning to appear weak. I came across an article on Better Homes & Gardens titled Solving Rose Nutrient Problems and found that it could possibly be deficient in various nutrients, one of which was magnesium. 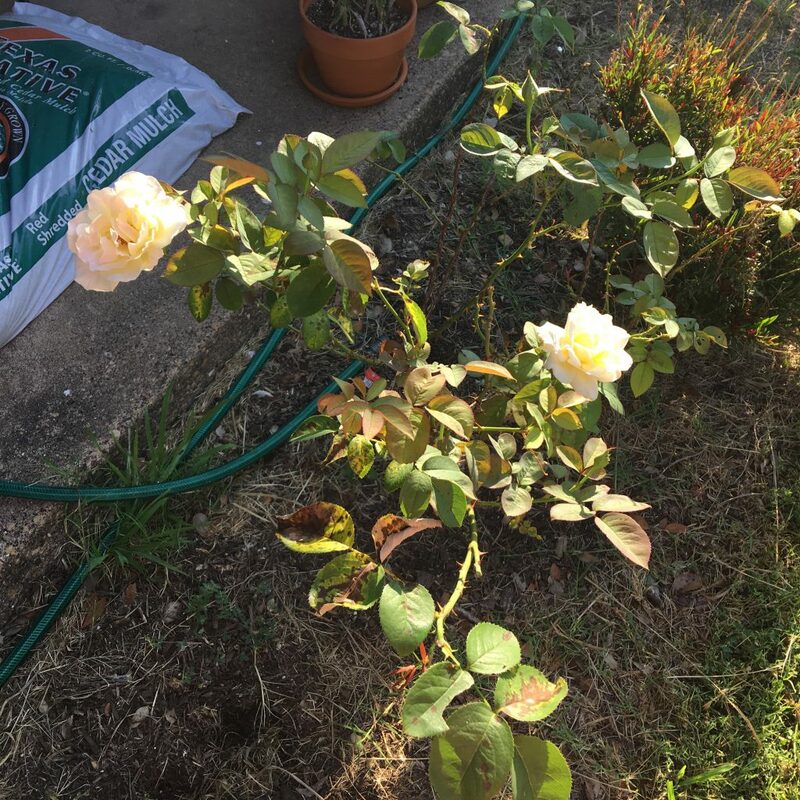 We had an abundance of Epsom salt around the house at the time so I decided to sprinkle a handful of Epsom salt onto the drip line and work it into the soil (the drip line is the outermost circumference of the rose bush where water drips to the ground). It was a quick fix until I could figure out what to do next. A few days later, the leaves began to darken and turn into a rich shade of green. I was fascinated. Since then, I’ve been like a sponge, learning and absorbing information about roses and rose culture left and right. There’s something mystical about the rose plant. In a way, they are very much considered the royal family in the garden realm. They’re so beautiful and elegant, but they’re anything but delicate. They have voracious appetites that require a regular feeding schedule in order to thrive. When left alone, they’ll live a long life and produce occasional flowers during the growing season. But when properly cared for, they’ll thrive and produce beautiful, vibrant blooms. They are survivors. They’re meant to be cut down (pruned) before becoming dormant in the winter, their canes stripped of leaves. They’ll grow back bigger and grander than ever the following season. Their thorns are painful reminders only to those who don’t know how to handle them carefully. All these things about the rose are so interesting because they’re characteristics that I can relate to. The first rose bush I have is the one described above. Craig, of course, knew nothing about it, so I really had to just search as many rose classes and narrow it down that way. It clearly wasn’t a climber, rambler, miniature, or polyantha. It had the typical rose bush structure, but it wasn’t an own-root rose. It was clearly grafted onto a stock root. I figured that out this season when an unfamiliar cane sprang out of the ground from underneath the base. It was a root sucker. 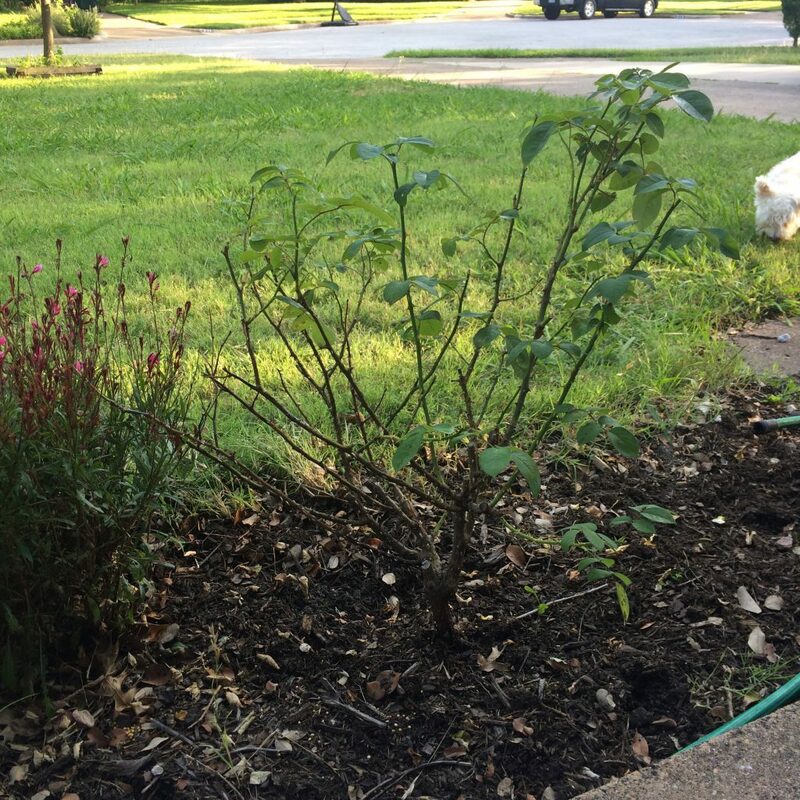 With grafted rose bushes, sometimes the stock root will try to take over the grafted plant if given an opportunity. It doesn’t look like any of the other canes and it needs to be removed at the base (NOT pruned, otherwise it’ll come back even worse). So I did what most rose guides suggested. I cut it out of the bush and made sure to remove it at the stock root. This required a bit of digging about an inch or two underneath the soil. Once removed, I then covered it up with a mound of soil and mulch. It hasn’t come back yet, but I’m keeping an eye on it. It didn’t seem like a floribunda either. 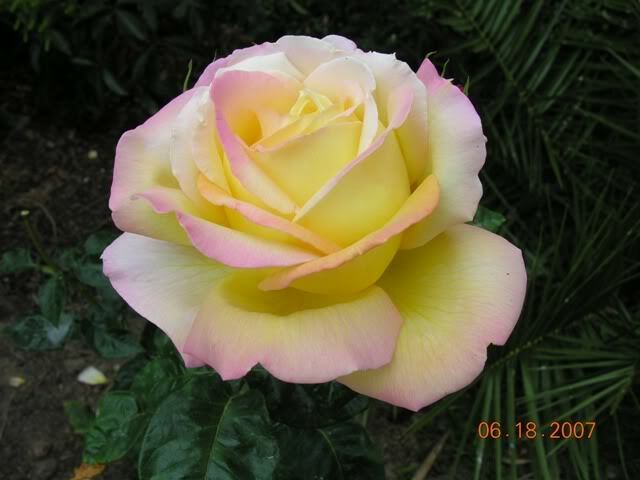 It primarily fit the profile of a hybrid tea rose or an old garden rose. But because it continually bloomed throughout the growing season, that ruled out an old garden rose and left hybrid tea. I don’t even know what that narrowed it down to, but even then it was still an astounding amount of roses to look through. What finally changed it all was this season, more specifically the second bloom of the season. After the last frost date passed, I began the task of clearing up the front garden bed. In addition to having to deal with the sucker that was on the verge of taking over, I also had to prune, fertilize, turn the topsoil, and refresh the mulch. The first bloom was like all the others the previous season: a pale off-white color, almost ivory. By now I had resigned to believing what I had on my hands was a plain, white hybrid tea rose like Full Sail. Don’t get me wrong, all roses are beautiful. But I don’t know, it’s like waking up Christmas morning and discovering Santa brought you a pair of socks and underwear. So I cut it and put it in a little vase to enjoy at my kitchen window. The next two blooms that followed it were what caught me off guard. As the sepals of the next bud began to pull back, I could already see that the edges appear like they had been dipped in red ink. The petals, rather than the pale yellow of the previous bloom, were taking on this buttery hue. The following day, I began searching more catalogs of photos, armed with this new information. And then I came across Peace. Shared by a user on gardenweb.com. The second bloom from my hybrid tea rose. Not quite so pale anymore! The markings and color were strikingly similar. I was so elated! It’s almost as if the years of neglect had caused it to recede into its shell. However, once it was cared for and loved properly, my rose plant finally trusted me enough to reveal her true self. I’m not quite sure what caused the change. 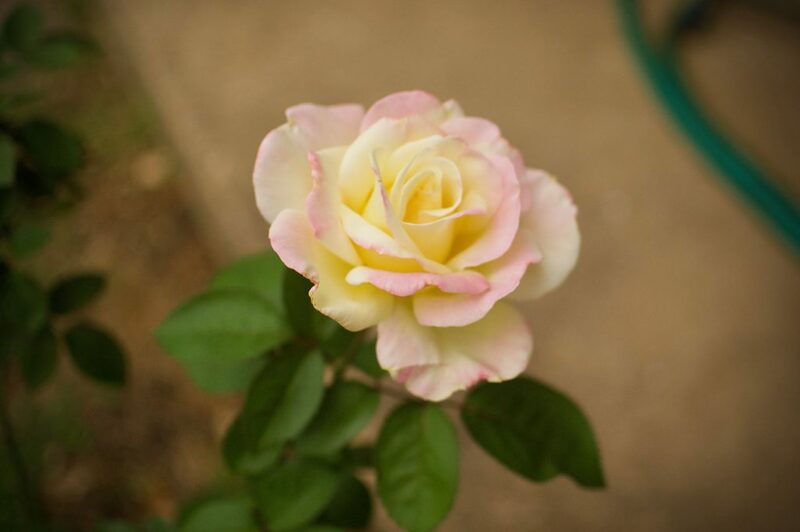 Supposedly Epsom salt improves the color of roses, especially if the soil is lacking this particular nutrient. Last spring, about every month or so during the growing season, I made an effort to apply a handful of Epsom salt into the soil and scratch it into the surface. I don’t remember noticing any major changes, other than perhaps the yellowing of the center petals and the darkening of the leaves. Maybe an improvement like this takes longer than a month. I feel quite proud of myself though and it makes me want to continue with my gardening endeavors.